Death isn't usually easy for those of us left behind, and learning of 2 in one phone call makes for a tough evening. I got a phone call from Mom on Wednesday afternoon. It was one of those calls that when the phone rings you get a weird feeling. As soon as I heard her voice I knew something was wrong. First she told me that my wonderful Great Uncle Duane had died. He's Grandpa's little brother and this was VERY unexpected. He is the first of 8 siblings to die. Which is pretty amazing given that the oldest is in him mid 80's. I have been lucky in my life to grow up surrounded by and close to my Grandpa's family. My wonderful Uncles (and Grandpa) are such loving, righteous, hard working, kind men. I hope that my boys can grow up to be like the "Ridd Boys". Here's Duane's obituary. Lt. Col. (ret.) Royal Duane Ridd passed away July 13, 2010 of complications following surgery. 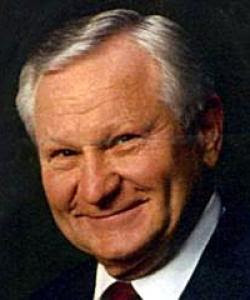 Duane was born on April 11, 1931 to Heber Eugene and Etta Ridd in Hunter, SL, Utah. In 1954 he married Janet Meriam Holding in the Salt Lake Temple. They are the parents of 6 daughters, have 15 grandchildren and 7 great grandchildren. He graduated from Granite High School and the U of U. After going through Air Force Flight and Gunnery Training he received his pilot’s wings and returned to fly in the Air National Guard for 24 years. He flew fighter jets, cargo planes, and air refuelers to over 60 countries and islands in the world. In 1992 he retired from Bank One after a lifetime of working in banking. He was an active member of the LDS Church. He served in 3 bishoprics and had many other church callings, most recently serving at the Utah State Prison as supervisor in the Family History Library. He was also a member of the Murray Kiwanis Club. He is survived by his wife and daughters Marianne Nattress (Robert), Laurie Shaw (Paul), Carolyn Smith (Ken), Linda Herzog (Ron), Rebecca Hammond (Wayne) and Sandra. Each of his daughters is so proud to call him Dad and they always knew that he loved them. Duane and Janet spent 56 years of marriage and loving each other. Funeral services will be held at 11:00 am on Saturday, July 17, 2010 at the Holladay 1st Ward, 2065 East 4675 South. Viewings will be held on Friday, July 16, 2010 at the Holladay Cottonwood Mortuary, 4670 So. Highland Drive from 6-8 pm, as well as one hour prior to services at the church. The second death however was an even greater shock. When I think of Griffin Call I think of a little boy in primary that was in the class ahead of mine. He's a little kid to me. Anyway he and Adam Bedke were up the canyon and Griffin fell into the creek. Adam pulled him out and did CPR while waiting for EMS. He stabilized long enough for him family to gather. My heart hurts for his family. I love Jeff and Mona and can't imagine what the are going through. Here's his Obituary: Griffin Decker Call 1992 ~ 2010 Griffin Decker Call was born to Jeff and Mona Call in Salt Lake City, Utah on September 10, 1992.A loving son, brother, and uncle, Griffin showed kindness towards all living things. He loved to read and learn, completing his high school educational credit early to pursue his education on his own terms which included playing music and traveling to unfamiliar places to increase his understanding of the world. Griffin possessed a deep passion for his interests, avoiding things he felt to be unimportant to his personal development. He loved spending time with his young nephews Creed and Levi, whom he greatly cared for. Always one to surprise his mother with flowers or spare an insect by taking it outdoors, Griffin was compassionate and seemed to exhibit wisdom beyond his years. Being the youngest child, he looked to his siblings for guidance, always impressing them with his advanced understanding. His infectious humor and wit will be missed, as he was often entertaining others with insight and laughter. Griffin also displayed stoic demeanor at times, with eyes that showed he was deep in silent contemplation. Griffin is a member of The Church of Jesus Christ of Latter-day Saints, and understood the importance of families. He loved being with his family. Griffin passed on Wednesday, the morning of July 14th as a result of injuries received in an accident in Little Cottonwood Canyon. He is survived by his parents, Jeff and Mona; siblings, Britney (Justin) Mellen, Tyson (Natalie), Riley; grandparents, Jessie Call, E.J. and Pat Decker. Preceded in death by grandfather, Lee Call. Funeral services will be held in his honor Saturday, July 17 at 1:00 p.m. at the Corner Canyon LDS Stake Center, 13366 South 1300 East in Draper, where friends may visit with the family from 11:00 a.m. to 12:45 p.m. prior to the services. Interment, Larkin Sunset Gardens. Hi there. I am Duane Ridd's daughter, Marianne and I found your blog but I'm not sure who you are. You must be one of my cousin's children, but which one? That was a really nice tribute to my wonderful dad. Thanks so much! I still need to write about him on my blog too. OK, I think I just figured out that you must be Elizabeth, Kathy's daughter! Thanks again for the nice comments about by dad. I love him and miss him so much. I still can't believe he was the first of the siblings in that generation to leave us. I know that it must have been his time to go because we are told that no righteous person will be taken before their time, and I know that I will see him again, but it still hurts really badly right now.